I feel you. 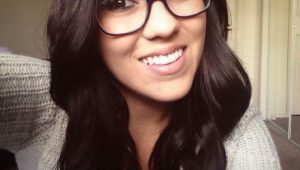 I want to make my eyes look as beautiful as possible as well. No matter the color of your eyes, you want to make them stand out. 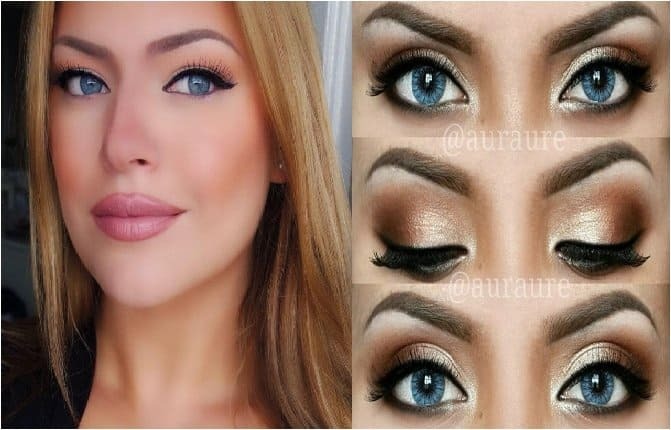 In terms of eye makeup for blue eyes, neutral shades are the best option. 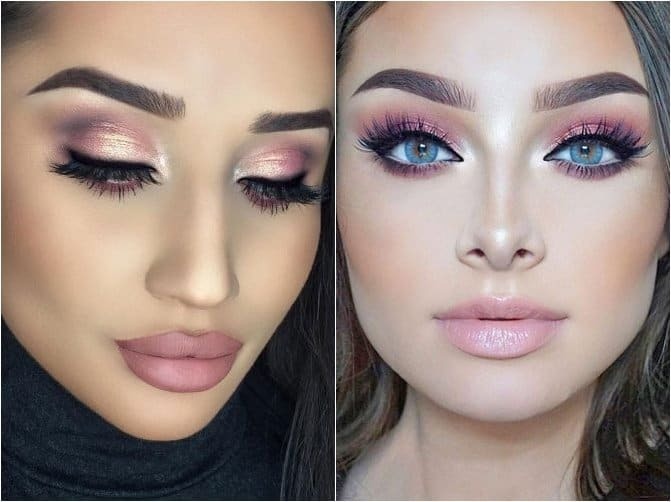 This usually includes champagne and taupe, both of which look excellent with blue eyes—you’ll get one of the best natural looks. Blue eyes look innocent and gentle, and that’s how you should treat them in terms of makeup. Today, we take a look at several ideas for eye makeup for blue eyes. Burgundy might not be a neutral color, but it will open up your eyes and allow your blue eyes to stand out. Burgundy looks flattering on blue eyes, and the first thing you should do is apply a matte shadow that’s very close to your skin tone. Follow it up with light yellow shadow to the crease and blend. Then apply a burgundy shade with a clean brush and blend the shadows together. Highlight the brow line and the inner corner with a white shade. Add mascara to the lower waterline. If you want to emphasize blue eyes, smokey eyes is one of the best ways to do it. For this makeup idea, mix peach and purple shadows for a bold look that will last throughout the day. Start by applying eye shadow primer. Start with a light peach shade and apply it all over the eye with a blending brush. Add black eyeliner, and then smudge it out using a small brush until you get a softer look. Apply dark purple shadow with a matte finish. Don’t forget the lower lash line. Apply taupe shadow on the crease followed by mascara, and top it off with false lashes. Gold and blue are contrast colors. 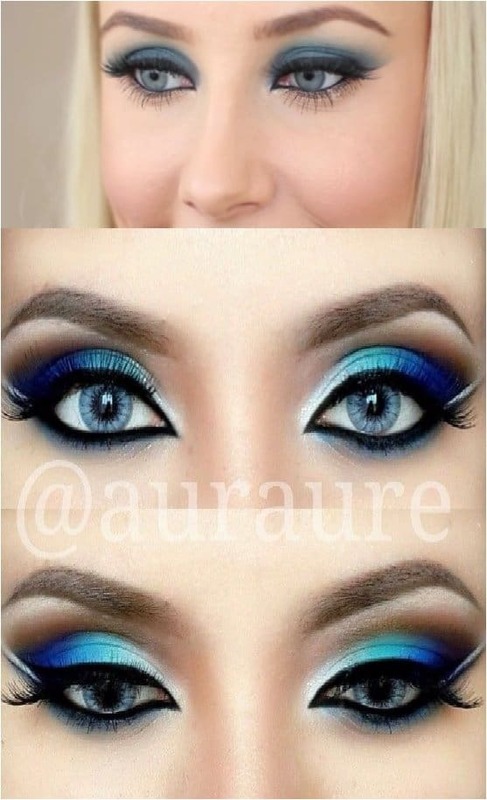 This makeup idea highlights the icy coolness of your blue eyes. 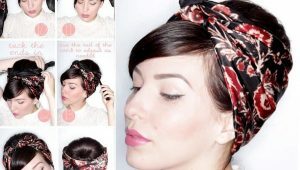 Think of it as one of the most natural, easy looks you can get. 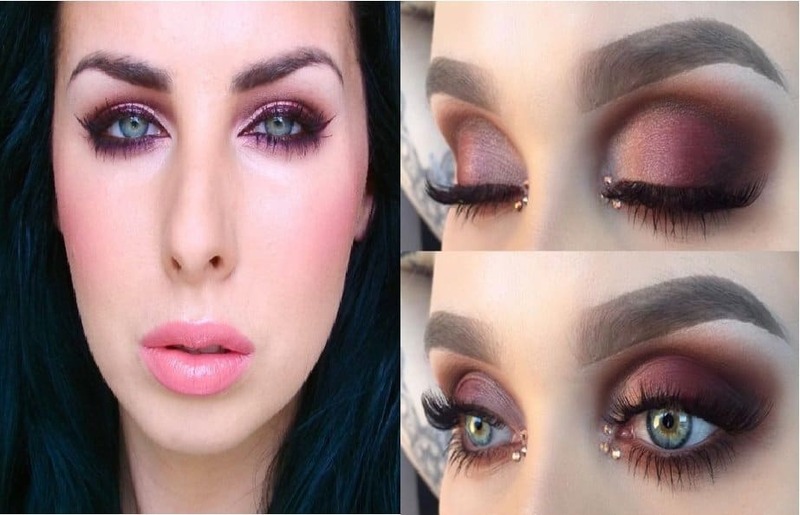 Use warm gold tones around your eyes for a warm frame. 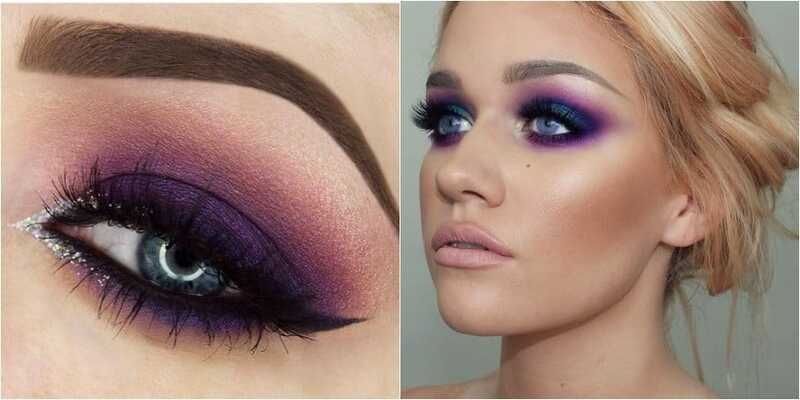 We had purple smokey eyes for a dramatic effect, but if you want a lower-key look, go for matte colors. You still get the mesmerizing effect of smokey eyes and the beauty of your blue eyes, but with a subtler look that doesn’t pop out as much. I said previously that neutral colors work great with blue eyes. In that spirit, you can combine pink, copper, rich brown, and gold hues. This look is for special occasions, and you start by applying eye shadow primer. Use a big blending brush to apply a neutral eye shadow, and then add white eye shadow as a base. Apply rose gold eye shadow at the center of the lid, and then pick a dark brown eye shadow to apply in the inner and outer corners of the eye. Blend everything with a clean brush. However, make sure that the color is concentrated in the inner and outer corners. Who doesn’t want a little glitter? 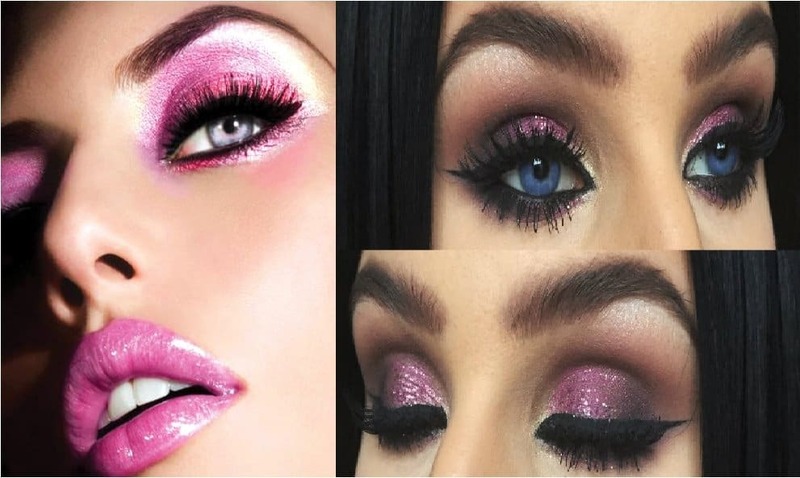 Blue eyes usually don’t need an introduction, but if you want a full-out, glamorous and luxurious look, you go for glitter. The look is feminine and makes a great contrast with your blue eyes. As mentioned several times, gold is a really good option for blue eyes. Apply eye primer over your lid, add base shadow, and then blend it with a soft taupe color. Apply gold eyeshadow, building the color with your finger. You don’t want a super clean look. Finish off with a pencil brush and apply dark brown shadow in the outer corner, blending it into the crease. Green and blue work very well together. 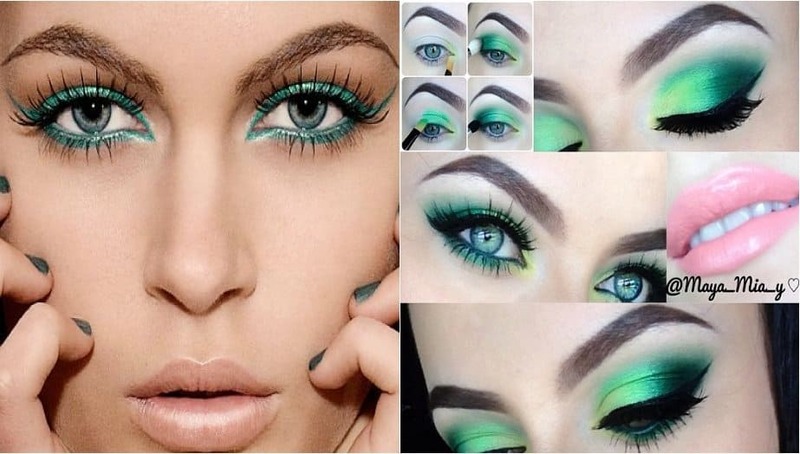 Warm, green colors tones are perfect for blue eyes, as they tone them down. I’ve said the same about green eyes: many experts will tell you that the same colors won’t work. 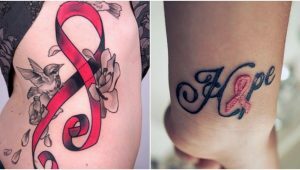 But that’s just plain wrong. Blue works well with blue, as long as you use a different hue of blue. 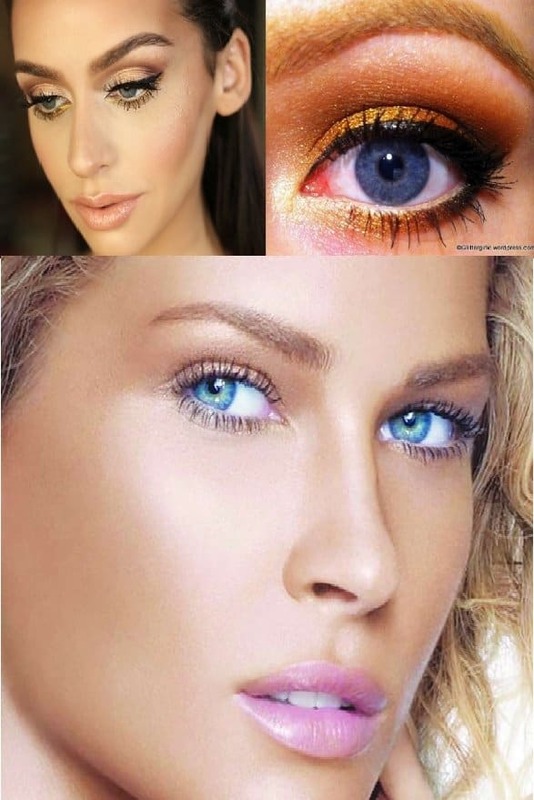 For example, if you have light blue eyes, a navy or royal blue eye shadow will give you a beautiful balance. For a quick, glamorous makeup, go for gold shadow and black eyeliner. It’s that simple. Start by applying gold eye shadow directly on the top of the base color. Use a fluffy brush to add medium-brown to the crease. 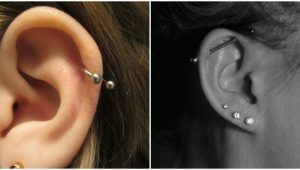 Blend the colors, and then top it off with liquid eyeliner and mascara. I would also like to give you some bonus tips for eye makeup for blue eyes. There are some tricks you can use to make your eyes pop—and isn’t that what we all want? Always apply concealer around your eyes. Your eyes will pop because of their beauty, and people won’t look at the dark circles beneath them. Always apply a base coat on your face, making sure you create an even tone. That way, people will be focused on your eyes. Don’t underestimate the power of the shimmer. Think of it as a fun way to add glamour to a casual look. Don’t use eye shadow that doesn’t emphasize your blue eyes. Terracotta is a good neutral tone, but if you feel bold, go with orange. Purple is probably the best color for blue eyes. 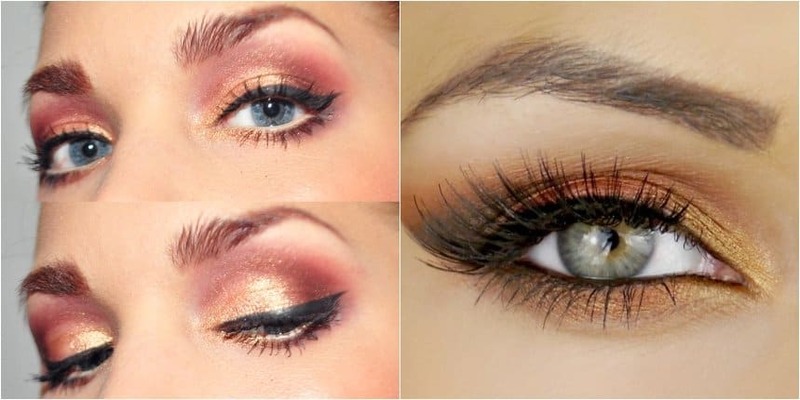 When you opt for smokey eyes, go for a neutral look with rich brown and gold. In terms of mascara, opt for brown mascara for the upper and lower lashes. How blue are your blue eyes? Not all blue eyes are evenly blue. Some are more blue, others are less blue. Sephora divides blue eyes into three categories, and each of them has a specific set of eye shadows that work best. The three categories are light blue (icy blue), gray blue (hues of blue and grey, sometimes even green), and deep blue (dark and light blue hues). For light blue eyes, use rich, neutral brown shades that will help you create the smokey eyes look. Your goal is to add depth and use it as contrast to the lightness of your blue eyes. The end result is a striking and dramatic finish. For gray blue eyes, use vibrant colors on the upper lid. Do the opposite for the lower lid, going for more neutral colors like brown. If you add vibrant colors to the lower lid as well, your eyes will look tired. For deep blue eyes, a dark brown eye shadow and blue liner is the best way to make them stand out. Don’t use black eyeliner, as it will make your eyes appear gray or silver. Balance the eyeliner with peach eyeshadow.